Spas, Decorative and Recreational Water Systems . We work hard to turn your spa dreams into reality. Our custom designs will help home and business owners enjoy beautiful spas and water systems. If your pool or spa is a few years old and out dated it may be time to enhance the look of your pool or spa and have your back yard become your own personal retreat. H2O Technologies will help you re-design your pool or spa area. 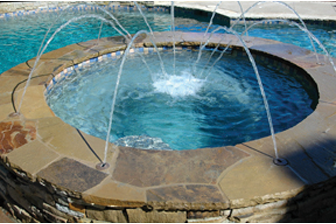 We understand swimming pools, fountains, spas, and water features better than anyone. When you deal with H2O Technologies, you get a highly-skilled, trained and experienced contractor that knows and understands every aspect of this industry. We are looking forward to working with you to create your unique water feature, pool, spa, koi pond or landscaping. Whether your spa is simple and elegant or complex and extraordinary, H2O technologies knows how to keep your spa looking its best.